WWW Conference News: Things To Do, Tours To Take! The conference committee is busy with plans to make the 2018 gathering in October one that will be fun, memorable, educational, and worthwhile. For those who are interested in learning more about the area, three tours will be offered. The first tour is Thursday, Oct. 25. Climb on a wagon and take a ride around the historic homes of Walla Walla. The tour will last approximately half an hour. The second tour takes place Friday morning. Those participating will visit Fort Walla Walla Museum. 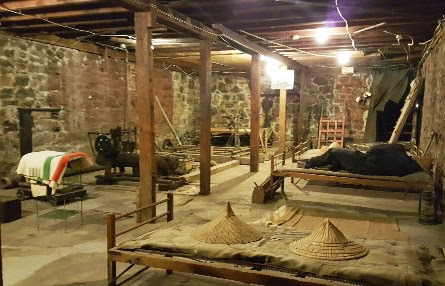 Located on the grounds of a 19th-century military fort, Fort Walla Walla Museum offers an exciting and educational opportunity for the whole family. The Museum features 17-building historic pioneer settlement, beautiful gardens, and expansive exhibit halls housing thousands of artifacts. The Entrance Building and Galleries feature fascinating exhibits, artifacts, and the Museum Store filled with books, heritage items, traditional crafts, old- fashioned toys and gourmet gifts. After exploring FWWM, the tour will take participants to a winery where we’ll see the facility and eat lunch. Following the winery visit, the tour bus will head to the Whitman Mission National Historic Site. The national historic site is the site of the former Whitman Mission at Waiilatpu established by Dr. Marcus Whitman and his wife Narcissa. Whitman Mission commemorates the Whitmans and their role in the progress of the Oregon Trail. The tour will return to the hotel in time for the conference opening that afternoon. This tour includes lunch, transportation, and museum admission in the fee. The third tour takes place on Sunday, leaving around eight in the morning and returning around four-thirty to five that afternoon. We’ll head to the historic town of Pendleton, Oregon. In the early 1900s, Pendleton was a rowdy Wild West town with 32 saloons and 18 bordellos. On any given day at that time you could find cowboys, ranchers, miners, farmers, sheepherders and railroad men rubbing elbows both above ground and below. The tour will include a stop at Tamatslikt Cultural Institute on the Umatilla Indian Reservation. Visitors to the museum can take a 10,000 year adventure in a single morning. Learn about the history, culture and hospitality of the people who’ve resided on this land for more than 10,000 years. Visitors will find interactive exhibits, rich with history, that celebrate the traditions of Cayuse, Umatilla and Walla Walla Tribes. We’ll head into Pendleton and stop at the Pendleton Woolen Mills. Opened in the early 1900s, the woolen mills continues a traditional of quality and endurance that has spanned generations. Blankets and apparel are what they are best known for, and the retail store carries a large assortment along with various gift items and textiles. Tour-goers will enjoy lunch at Hamley’s Cafe before heading to the Pendleton Underground Tours. Pendleton Underground Tours is a non-profit corporation that started in 1989, giving tours of Pendleton’s former red light district. Originally, the tour was very controversial because part of the subject matter covered gambling, the Chinese, bootlegging and prostitution. The history of legal and illegal businesses operating beneath Pendleton’s streets makes the tour unique and incredibly interesting. The tour is suitable for all ages, but note there are stairs to climb. This tour includes transportation, lunch, and admission to museums. If you’ve already registered but decide you’d like to add a tour, hop onto the website and add the tour through the online registration form. We look forward to seeing you in Walla Walla in October! This entry was posted in WWW General News. Bookmark the permalink. 1 Response to WWW Conference News: Things To Do, Tours To Take! Shanna outdid herself with these tours. I hope you can all make it. I can’t wait!